Since making this recipe I have made some modifications to the recipe. I use farro or sorghum instead of textured vegetable protein because I always have these two on hand. You could also use quinoa. Place textured vegetable protein in a medium bowl, pour hot water over the protein, add the taco seasoning, stir and allow to set until water is absorbed completely. If you use farro, quinoa or sorghum add the taco seasoning to the grain the last 10 minutes of the cook time. While protein is absorbing the water, mix together the tomatoes, jalapeño, red onions and cilantro. Season to taste with salt and pepper, cover and set aside. Slice and juice the lime, slice and pit the 4 avocados and pour the lime juice over them to prevent browning. Place the ingredients for the avocado cream in a blender and process until smooth, taste and season to taste with sea salt. Transfer to a serving dish. 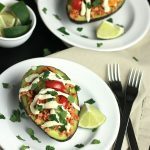 Scoop two heaping tablespoons full of the textured vegetable protein into each avocado, spoon some of the tomatoes and avocado cream over the vegetable protein, garnish with cilantro and serve with a wedge of lime.